The concept of video gaming has changed a lot in recent years, as mobile devices have become ubiquitous. And while more types of people may indeed be playing more games more often these days, even though much of this is dubbed “social gaming,” the actual physical practice is less social than ever — it’s just one person heads down with his or her mobile device. 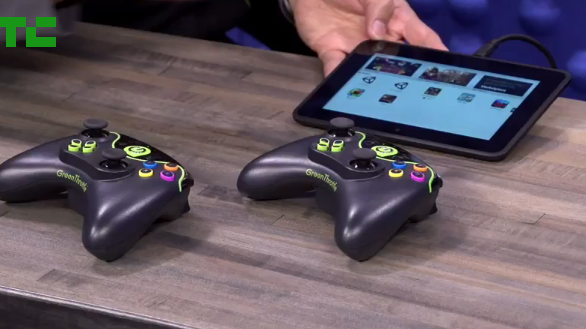 A new startup called Green Throttle wants to shift that balance a bit by allowing any Android device to power games that multiple people can play together on a television. The Santa Clara, California-based Green Throttle is announcing today that it has raised $6 million in a Series A funding round led by Trinity Ventures with participation from DCM to realize and scale out that vision. It is indeed a big vision. Green Throttle is angling to be a mobile app developer, a gaming device manufacturer and seller, and a gaming studio of sorts. It sounds complicated, but the whole thing is really quite simple in practice. The system works by downloading the Green Throttle “Arena” app to any Android device with an HDMI outlet such as a smartphone or a tablet like the Kindle Fire using a standard HDMI cable to connect the device with a TV, and turning on one or more of Green Throttle’s custom “Atlas” controllers which work via Bluetooth. The company is also working on an iOS-compatible platform. Green Throttle has developed a handful of its own games, and it has also opened up its platform with an SDK so that any developer can build games that can be played on the system. Green Throttle will take no percentage of the sales of these games — game developers will only have to pay the standard commission taken by the Android or Amazon app stores. A key aspect about Green Throttle is its founding team led by CEO Charles Huang. Huang is best known today for co-founding RedOctane, the company that created the ridiculously popular Guitar Hero video game series and was sold to gaming giant Activision (now Blizzard Activision) for a reported $100 million. Guitar Hero has since been shut down by Activision, but while it was hot, the game was really hot. “When I pick up a tablet or phone and look into it, I now shut you off and everyone else around me. and while they’re fantastic devices, that’s part of what’s crept into games and other content is this isolation of the individual once they start using the device. And what we wanted to do was to reintroduce — on the same device, to re-imagine — what it means to play games with friends and family. When both of us look at [a television] screen, we’re sharing this experience and we’re able to interact with each other. Of course, what comes to mind when thinking of things in this vein is the Nintendo Wii, which had lots of success in recent years by bringing the family around the TV to play games. But the fact is that today many Wiis that were bought a couple years ago are collecting dust, and Nintendo’s financial performance is feeling the pain. Maybe there is only so much bowling and tennis a person can play. That seems to be a lesson that Huang himself learned with the rise and fall of Guitar Hero: Even the most popular games often have a shelf life. That’s why the real genius I see with Green Throttle is that it has opened up its platform to developers so that its suite of games has the potential to stay very fresh. In many ways, it’s what companies like Nintendo should have done a long time ago — but as we know, it often takes a startup to have the clear vision necessary to do the smartest thing. In all, Green Throttle is a big idea that might be coming at just the right time.